Spreading out for miles at the headwaters of Lake Marion, the dark fingers of Sparkleberry feed and harbor wildlife and form watery trails leading deep into the river swamp for those seeking traditional sport or other adventures. Far away, an owl calls, breaking the white noise of softly shifting cypress branches. Persistently, it calls, until another and then another, from different locations, call back. If you were sitting still and quiet in a boat in Sparkleberry Swamp surrounded by cypress trees and Spanish moss with the twilight moving in, you'd likely hear the vocalizations of owls preparing for a night of hunting. Other sounds, too, would reach you on the gentle breeze, from the treetops overhead and from the inky water below: songbirds sounding off in the treetops, insects buzzing and fish going after them. Choruses of frogs might join this wild swamp symphony; then the sudden sound of a sizable swirl off your bow - something large? Who knows? For Sparkleberry remains an untamed place, and its inhabitants, out of tune with modern life. They live as they have always lived and - given the chance - will continue to do so, perfectly adapted to life in their river-swamp home, as wild and beautiful as its name. Sparkleberry: the name fits one of the most picturesque natural areas in South Carolina. I can still remember the magic in that name when my brother Merritt and his friend Adrian "Bubba" Farmer first took me to this wonderful place for a duck hunt on a cool November afternoon in 1965. On my first visit, I thought the beautiful name came from the large seed balls hanging off the numerous aquatic shrubs; my botany professor at Clemson assured me the seed balls actually belonged to buttonbush, Cephalanus occidentalis, and that sparkleberry, Vaccinium arboreum, a large bush or small tree, was a member of the blueberry family that grew on sandy soils on high ground. Sparkleberry Swamp lies at the headwaters of Lake Marion, a part of the Upper Santee Swamp formed by the junction of two mighty river systems, the Wateree and the Congaree. Between them, these rivers drain more than 15,000 square miles of watershed. The Upper Santee extends southward to the Rimini-Lone Star railroad trestle and contains 16,000 public acres owned by the South Carolina Public Service Authority, better known as Santee Cooper. Locals know exactly what you mean when you say you're going to "Sparkleberry," but the nebulous boundaries change depending on who you talk to. In fact, Sparkleberry is both a part of the Upper Santee and the name of a boat landing on the east side. Still, you would probably be on safe ground referring to anything on the east side of the Upper Santee as Sparkleberry. Sparkleberry fits the popular image of the mysterious Southern swamp created by Hollywood legend - cypress and tupelo trees standing in tannin-stained black water and dripping with Spanish moss. At certain times of the year snakes do hang from the limbs of bushes lining the waterways (but they are non-poisonous water snakes), and alligators bask in the sun. Although no quicksand lurks in Sparkleberry to swallow up fugitives from the law and unwary tourists, a new visitor could easily get lost without a guide or a GPS. Thankfully we have moved beyond the Hollywood stereotype, and more and more people now appreciate the incredible beauty of swamps and wetlands, as well as their high economic and biological values. In a state full of natural crown jewels, Sparkleberry would have to rank as one of the brightest. 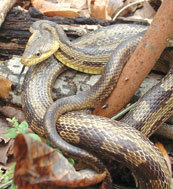 Sparkleberry is one of the most prolific wildlife refuges in South Carolina. Hunters and fishermen have known this since the swamp first opened for public access, but wildlife watchers, photographers and kayakers have only discovered Sparkleberry in the past few years. On a Sparkleberry paddle last fall up "Deep Creek," I saw hundreds of white ibises, dozens of egrets and herons, water turkeys, and many wood ducks, flushed two otters from a tupelo stump, saw three raccoons, jumped five deer, including one fawn with a red coat, heard barred owls, red-shouldered hawks and pileated woodpeckers (sorry, no ivory-bills) and had an up-close view of a 10-foot alligator. 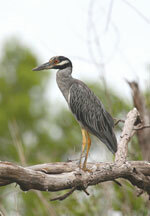 A few years ago S.C. Department of Natural Resources staff discovered at Sparkleberry probably the largest yellow-crowned night heron colony in eastern North America. Biologists counted more than 900 nests, a remarkable figure for a normally solitary or semi-solitary nester. Because of its abundant and diverse bird life, the National Audubon Society has recognized Sparkleberry as one of forty-two Important Bird Areas in South Carolina. As mysterious and full of life as it is, Sparkleberry is not a true natural area in the sense of being unaltered or lightly disturbed by the hands of man. The water levels that make boating possible are an artifact of the backwaters created from the Lake Marion dam in 1941, and before the dam nearly all of the swamp timber had been cut out. The restorative powers of nature are strong, however, and today Sparkleberry has the appearance of a true swamp wilderness. This wilderness lay at the center of one of South Carolina's first post-Earth Day environmental battles. In 1971 the Public Service Authority, without public knowledge, initiated plans to sell the swamp's timber to the highest bidder. 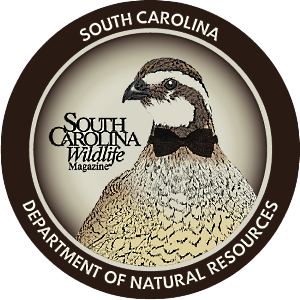 When word got out, a huge battle ensued, led by the Sumter County Game and Fish Commission, Columbia Audubon Society and many individual sportsmen and conservationists. The fight made front-page news and galvanized the state's fledgling environmental movement. Faced with mounting public pressure and scrutiny from some legislators, the Public Service Authority canceled the timber sale. Now the PSA manages Sparkleberry and the Upper Santee as a natural area, open to the public for a variety of outdoor uses, including hunting, fishing, boating and camping. Today, Sparkleberry has once again become the focus of conservationists. The Congaree-Wateree-Santee Basin Initiative, more recently named the Cowasee Basin Focus Area, was established to promote protection of the swamp and to steer development away from the area. The effort hinges largely upon voluntary private-land conservation easements to protect the 215,000-acre ecosystem that stretches from just below Columbia down to the Rimini-Lone Star Railroad Bridge and then north along the Wateree to I-20. Public lands that hold this ecosystem together include Sparkleberry, Congaree National Park, Poinsett State Park, Manchester State Forest and the Wateree Correctional Institute. Although much of the area in question consists of undevelopable wetlands, conservationists wisely drew the boundaries to include adjacent uplands that buffer and protect the critical wetlands. Some of these uplands have historical and biological significance themselves. The key to success in this endeavor will be support from private landowners and voluntary use of conservation easements. Along with private landowners, partners in this initiative include the DNR, Congaree Land Trust, Ducks Unlimited, Richland County Conservation Commission and the Natural Resource Conservation Service. These partners are working together against a number of serious threats to the Sparkleberry Swamp ecosystem. Development pressure in the area, including a possible bridge to span the upper Santee Swamp between Lone Star and Rimini, threatens to degrade water quality and overall habitat for a wide variety of species that call the swamp home. Invasive weeds and other changes there make recreational access more difficult and crowd out native species. Most of us think of natural areas and wilderness as static and unchanging landscapes, but during a span of forty years visiting Sparkleberry, I have witnessed numerous changes, some more subtle than others. When I first started going there in the mid-1960s, water levels were so low that we were able to use chest waders to explore much of the area. With the 1970s came several years of high water and a large number of the shallow-rooted oaks and sweet gums fell over. Many of the abundant dead trees, created by the backwaters of Lake Marion in the 1940s, that made Sparkleberry such a haven for woodpeckers finally rotted away. With increased sunlight, exotic plants like alligator-weed, smartweed, Brazilian elodea and water primrose expanded into waterways, inhibiting boat traffic. In some areas Sparkleberry looked more like a marsh than a forested wetland. In the 1980s and '90s new aquatic plants, like cut-grass, elephant-ear, water hyacinth and the worst of all, hydrilla, made the aquatic weed problem even worse. An old member of the swamp fauna from 150 years ago, the beaver, re-introduced itself to Sparkleberry about 15 years ago. The beavers' work - dammed-up sloughs and small creeks - will benefit much of Sparkleberry's wildlife, especially in fall when water levels are low. One of the biggest, and saddest, changes in Sparkleberry has been the dramatic decline in waterfowl numbers, especially the "big ducks" - mallards and blacks. For reasons that are still not fully understood, the large number of overwintering mallards that once showed up after Christmas has greatly diminished in the past fifteen to twenty years. And the wary black duck, so fond of the thick, flooded timber, has just about disappeared from the Sparkleberry hunter's bag. Research in the nearby Santee National Wildlife Refuge provides a good indicator of waterfowl numbers in the Sparkleberry area, documenting the decline. Biologists studying ducks there report that numbers peaked in the late 1970s. From 1975 until 1981, counts estimated peak numbers of ducks using the refuge in excess of 100,000 each year, with the highest count of 179,000 occurring in 1978. During the 1960s, '70s and early '80s, the Santee NWR and the surrounding lake areas made up an important wintering area for a variety of waterfowl, especially puddle ducks. Mallards and wood ducks were the most common winter residents, but refuge biologists also found good numbers of teal, wigeons and gadwalls. Hunters found public waterfowl hunting in the surrounding lake habitats exceptionally good during this period. But waterfowl hunting success dropped rapidly during the early 1980s. By the mid-eighties, the peak number of ducks overwintering in the Santee National Wildlife Refuge, which borders Sparkleberry Swamp, had dropped to just over 20,000. Only since 1986 have estimates exceeded 30,000 ducks. Because of the popularity of the Santee region for public waterfowl hunting, the declines in waterfowl numbers have evoked much concern. But what caused this decline? Biologists suggest a number of possible explanations: short stopping by Northern states, lake eutrophication, loss of acorn-producing hardwoods during Hurricane Hugo and during extensive timber harvesting, changes in the lake aquatic plant management strategies and excessive hunting pressure. The good news is that the release of sterile grass carp has greatly alleviated the water weed problem, and now many of the smaller creeks and sloughs are once again navigable to small boats and canoes. More good news: a lot of the laurel and water oaks lost to high water and Hurricane Hugo are being replaced by their own kind. In a few more years, these young oaks will be old enough to provide abundant crops of acorns for deer, turkeys, wood ducks and other members of Sparkleberry's wildlife community. 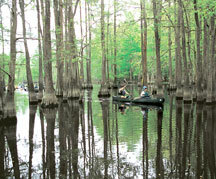 With improved access and a thriving wildlife population in the swamp, more visitors want to explore the area. To gain access to Sparkleberry, you need a boat. Duck hunters and fishermen prefer the aluminum flat-bottom with a small outboard, but I traded in mine years ago for a canoe, and more recently a nine-foot kayak, a perfect craft for experiencing the swamp's sights and sounds. I once got so close to a buck eating acorns on a Sparkleberry ridge that I could hear him crunching them in his teeth. Even with the right equipment Sparkleberry can be a little intimidating for novices. With the myriad channels and watercourses that wander everywhere, it would be easy to get lost. Many of the "trails" that have been marked with spray paint on the trees lead to dead ends. 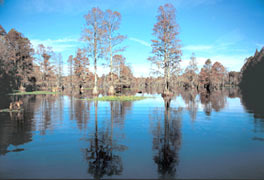 Varying water levels, which can fluctuate several feet or more, can completely alter the swamp's appearance and lead to more confusion. However, GPS technology has now made it possible for even first-time visitors to explore Sparkleberry with confidence. Visitors should note that the swamp changes dramatically with the season: the dark-tunneled tupelo slough full of green duckweed in July turns into a sunlit bare opening in January. The delicate, light-green, feathery foliage of bald cypress signals the beginning of spring, and fall is quite beautiful as the cypress needles start turning a rusty brown and provide stunning reflections off the black water. These seasonal changes can make Sparkleberry a mysterious, difficult to-navigate wilderness. But they also make the swamp an amazing and varying experience throughout the year. John Cely is a retired wildlife biologist, formerly with the S.C. Department of Natural Resources, and a skilled naturalist.